Halong Bay is 170 km from Hanoi city and it will take several hours to transfer from Hanoi. Currently, there are 2 main roads which connect Hanoi and Halong Bay. National Highway 18 through Bac Ninh and Chi Linh city. Transfer on this road will take 3.5 hours. The New Highway Hanoi – Hai Phong – Halong (Motorbikes and bikes are prohibited). It will take 2 hours to transfer on this road and of course, the fee is higher. Most of visitors travel to Halong Bay are to visit the Bay and overnight in cruise. 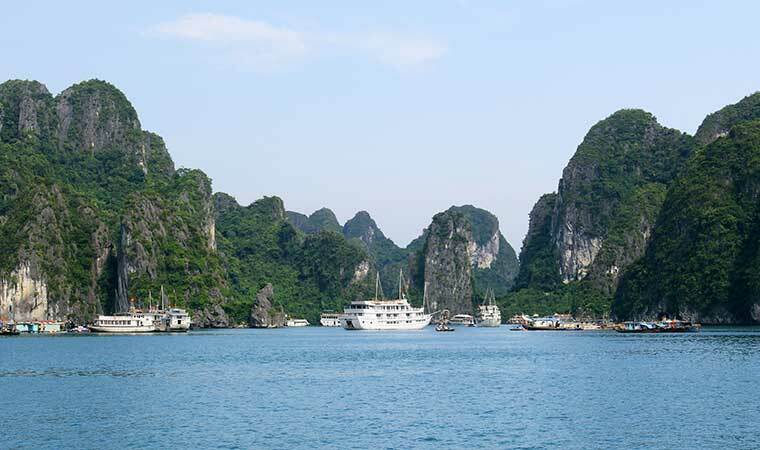 Therefore, you should check with the cruise if they will offer free transfer from Hanoi to Halong Bay? Some cruises will offer free transfer which is included in the package. If so, you will save the budget. Otherwise, it will cost you 10 – 15 USD for a transfer of 3-star cruise and about 20 – 45 USD for a transfer of 4-5-star cruise. If you do not care about the budget, you can book a private car transfer. Especially, It will be good for a family or a group of friends from 3-4 persons, private car transfer seems to be the best choice. Both saving your budget and being on time and on site. Driver will be more professional and careful. Round trip will cost you about 130 USD for sedan (2 pax) and 180 USD for a minivan 15 seat( for 3- 8 pax) this is for the schedule 1 night stay in Halong Bay. You can ask any online travel agent or any hotel for booking, they could arrange private car. However, we recommend you book in advance before your travel date to make sure the service is available and you will get the best price. These are actually 15 seat Ford Transit minivans which are modified into 9 seats, making for more spacious and more comfortable. The transport companies will pick you up at your hotel in the city and drop you off at any address: Halong Bay port, hotels in Halong city. 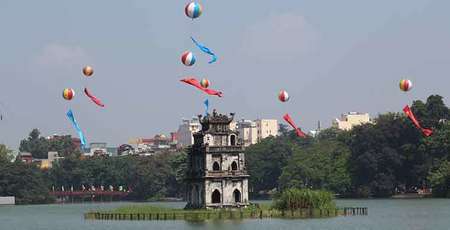 The travel time from Hanoi to Halong Bay will be only 2 – 2.5 hours. However, due to the pickup and drop off time, so the real time in bus will be around 3 – 3.5 hours. This is the disadvantage of this way. 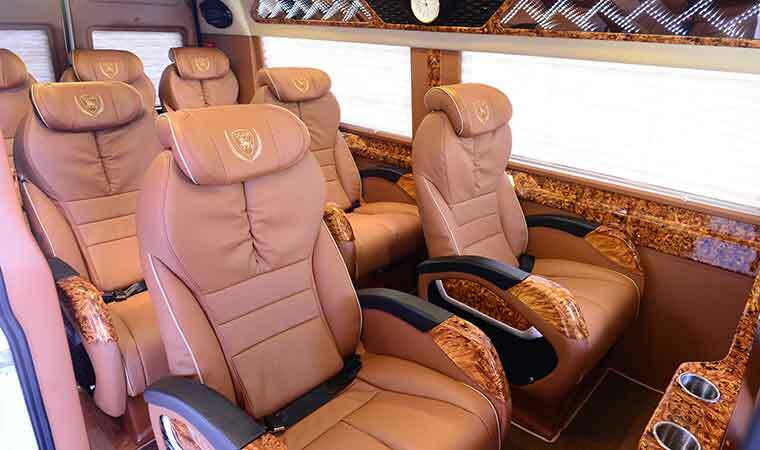 The advantage is that the seats are big and comfortable, less tourist in car and the price is also quite cheap, just from 9 USD for the front and back seats, 12 USD for the middle seats. This is the price for one-way transfer. This is the way of transportationwhich will take the longest time and sometimes, it is probably not the cheapest way. 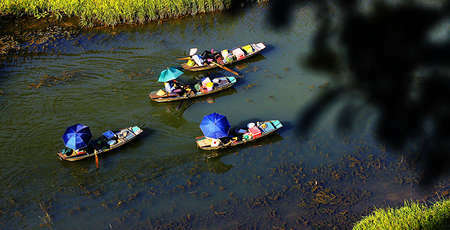 This is only an experience of local life in Vietnam. 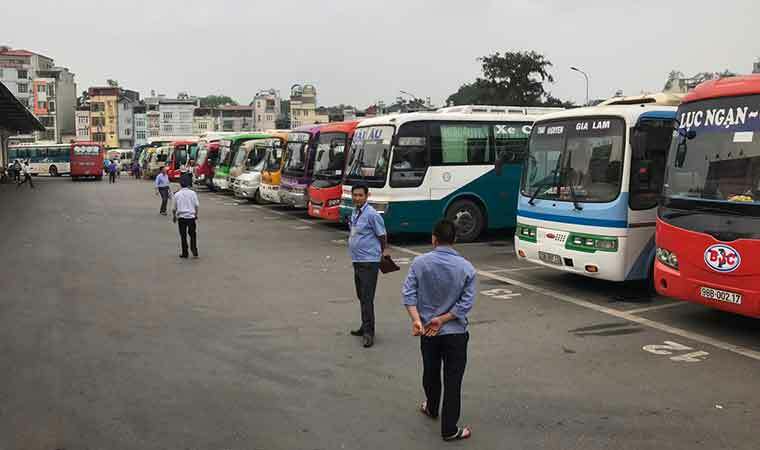 You will have to go to Gia Lam bus station and buy ticket to Bai Chay ( Halong) bus station. Travel time may be 4 hours because they will stop along the way for pick up and drop off passengers. The ticket costs about 5-7 USD. However, you will spend extra for taxi to bus station and to hotel or Halong port. 1 USD = 23 200 VND and you will have to pay in VND. USD is not accepted. By Seaplane Hanoi to Halong Bay. This is the most expensive way. However, this will offer you an impressive experience. 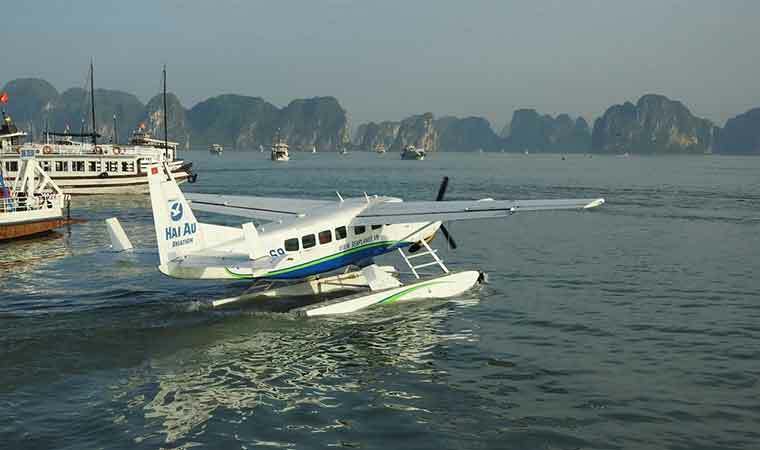 Transfer from Hanoi to Halong Bay by seaplane Hai Hau Aviation. 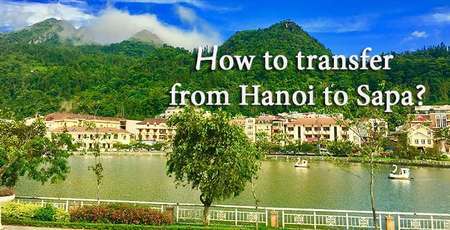 The flight will start from Noi Bai airport ( 30km from the Hanoi city). 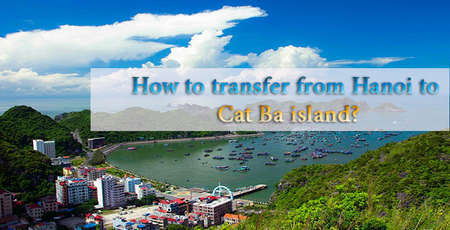 Transfer to Noi Bai airport for check in procedure and fly to Halong Bay. The aircraft will land on the Bay at Tuan Chau port. The flight takes 30 minutes. There are 2 flights per day. At 10.00 for a fare of 405 USD(included 15 minute flight over Halong Bay for sightseeing) and the flight at 14.00 with 175 USD fare. Contact for booking: online.sales@haiauaviation.com and hotline: 0962 069 689. 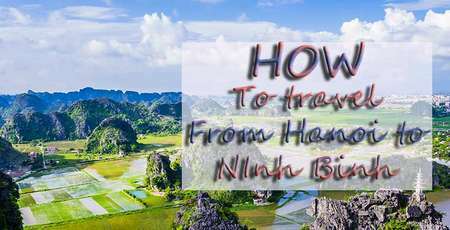 So you have 5 ways to travel from Hanoi to Halong Bay. 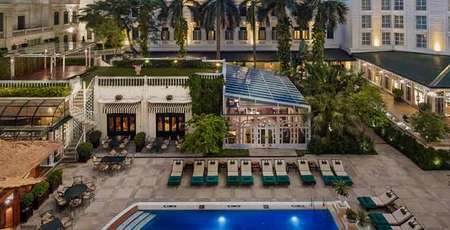 Choose the most suitable one for you and enjoy your exciting stay in Halong with many discoveries about the Bai Chay beach and Halong City, Halong Bay and the Ocean park entertainment.